Description: This visitor needs you to create a comfortable and innovative outfit for a trip in Columbus. Guide her with your fashion sense. Instructions: Use your mouse to click on and through the floating hair, clothing, and accessory options for this world traveler. Explore the Czech fashion trends and stylize a darling must of the season. 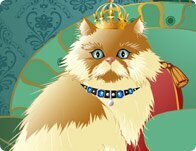 This affectionate feline is a prince among cats. Dress him in accessories and fur fit for royalty, decorated all the way to his cute and fancy free pillow.